Watching China Change Through My Class – Writer. Traveler. Tea Drinker. Since I got here almost 7 years ago, I have made all my own lesson plans–dozens over the years. They have been tested, honed, and perfected where I know they will get the maximum class participation while teaching something useful. In the past several years, say about four, I haven’t changed much. If it ain’t broke, don’t fix it right? Three years ago I wrote about a class about the 10 most influential Chinese people. I still do that class, still have the students come up with their own list, and as it is “of all time” I kinda always expected the same answers: Mao, Confucius etc. But a new name has popped onto the list and not just in the low digits, but very high up. Move over chairman Mao and Confucius. There’s a new player in town. Jack Ma is the founder of Alibaba (which had the highest IPO in American stock market history) and Taobao, the worlds largest shopping app/website. Taobao has been around for awhile, and popular, but things have really taken off only in the past few years. Alibaba also pioneered alipay which is a mobile payment system and it has basically changed the face of China (I’m gonna write more on this soon). So yeah, I don’t disagree with my students. He is incredibly influential. 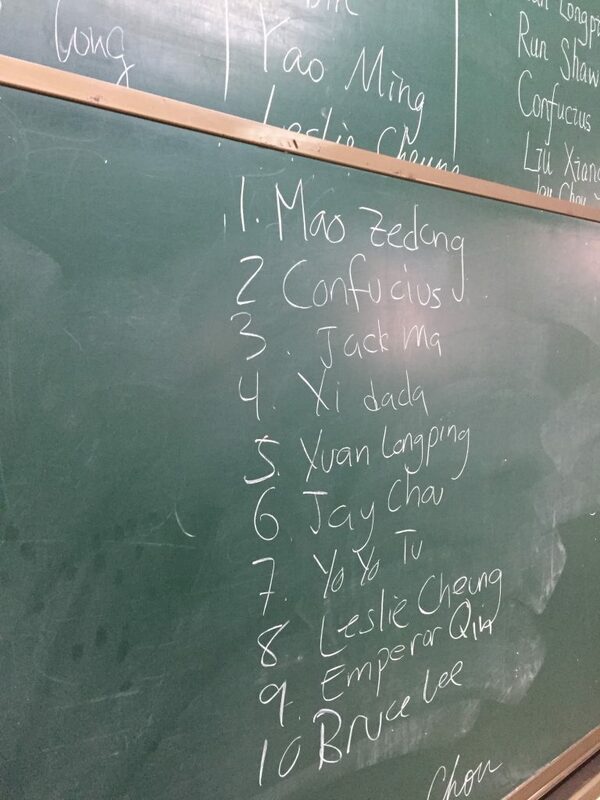 Another class decided that Mao and Confucius is more influential but Jack Ma secured the third spot. Not bad. You’ll notice another new name to the list “Xi Dada.” That’s Chinese president Xi Jiping. What’s interesting to me is he wasn’t included on the lists before. Maybe because he was new a few years ago, or maybe, because he really picked up steam in the past year and a half or so. Also, notice the students all refereed to him as Xi Dada, which means Papa Xi. It’s a cutesy nickname (which I’m guessing started in the government) to kinda give him a softer image with the people. And it’s working! In the past everyone referred to him as Xi JingPing. Now it’s all “Xi Dada,” and nothing else. You can watch this video of foreigners in China talking about “cute” Xi Dada to see how hard the government is pushing this idea. Famous people aside, there have been some other changes, specifically in my students acceptance of others. In my first class, with new students, I always let them ask me any question they want. We go around the room, one-by-one and they usually ask me the typical things: What school did I go to? Do I have children? How many places have I traveled in China? Over the past few years questions about gay people have entered the conversation. Usually along the lines of “do you have a gay friend?” I think they think Americans are modern and open-minded and are curious about it. This year I was asked what I thought of gay people. It was a girl that asked and there were no giggles or any embarrassment from anyone. 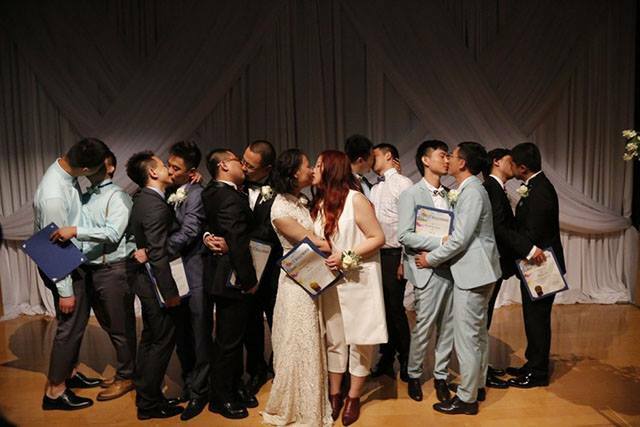 Gay rights still has a long way to go in China, but acceptance is beginning to grow. I can see it in my students. I was flabbergasted for two reason. One–that’s really high level English and this was from a freshman class. Where did they learn that vocabulary? And two–what a really sensitive way to ask that question. Very PC, which China is not known for. Again no one laughed or giggled (and they always giggle) and they all looked at me curious. I felt like they had all gone through sensitivity training or something. But this is China and I know there is no way they did. Not at a government university. Talking about gay people has come up a lot in class, but usually when the students have known me a long time, and when it’s relevant (say, when talking about marriage). This was on the first day of class, and by students who didn’t know me at all. I was very impressed to say the least. I’ve been here a long time now, and the fundamentals of my job haven’t changed: college kids, same age, same lessons, mostly girls, yet I have seen such changes in their thinking and their behaving. Just when I think I’ve seen it all, my students continue to surprise me, and teach me as much (if not more) than I teach them. Fascinating and promising, I guess? I had no idea people called the president “Xi Dada” — that just cracked me up! I did tell them I was straight but that if any of them were gay they could tell me and it wasn’t a big deal. I was wondering why they asked me and earlier they had asked if I had a boyfriend. I said “not really.” My meaning was I don’t have anyone serious, just casual. But I think they picked it up and assumed I didn’t have a boyfriend, but rather a girlfriend. Either way, impressed with their picking up subtly.